We play all night starting at around 9pm. Grab a friend or two, or six and come on down. 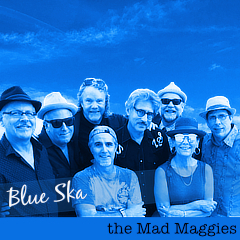 Help us make it a right Irish bash! Happy St. Pat’s day to you! / Beannachtaí na Féile Pádraig oraibh! Our Day will Come! / Beidh ár lá linn! Ireland Forever! / Éirinn go Brách! The Sleeping Lady has great food! Come early for dinner and stay for the music. 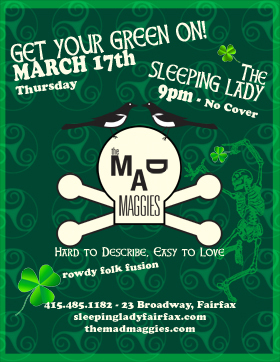 beer, big fun, Ireland Forever, live music, Saint Patrick, the mad maggies.